At Ability we understand that architectural design is an exacting art that demands a focus on detailing as much as on the ‘big picture’. An important aspect of the final success of a project is accurate colour correctness in the detailing. Ability has excellent news in this department! We offer some of the most innovative and reliable colouring products for cement and for colour matching cement coatings. Many Australian Architects are very familiar with our extensive range of abilox® fine, UV resistant, inorganic mineral oxide colouring pigments and with Ability’s duro paint™ range our long lasting, all weather resistant eco-friendly coatings, guaranteed for 20 years (conditions apply). 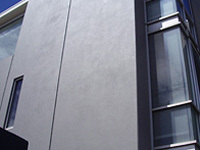 These products powerfully enhance all urban project work - resulting in outstanding durable colour matching within the cement itself as well as for surrounding cement areas that need durable coloured coatings to match. • a variety of Ability products that work together to assist you to achieve maximum durability and colour correctness in your cement coatings as well as with matching extra long life cement paint finishes. Before starting your next project contact Ability and our friendly staff will assist you with any of your colour or Ability product queries. • Is an excellent product used to rectify rain-damaged, pitted concrete pavements and suspended slabs. • Is extremely durable - guaranteed for 20 years against flaking, lifting and peeling when applied as recommended to a vertical surface.